For quick and simple online ordering of V-Ray Next for Maya, visit our new eStore. GPU+CPU Rendering: Optimized CPU rendering in V-Ray for Cinema 4D provides all-new speeds, plus enjoy blazing-fast GPU rendering for previews and final-frame renders. V-Ray’s feature-full production toolset delivers high-quality, physically accurate images and animation. 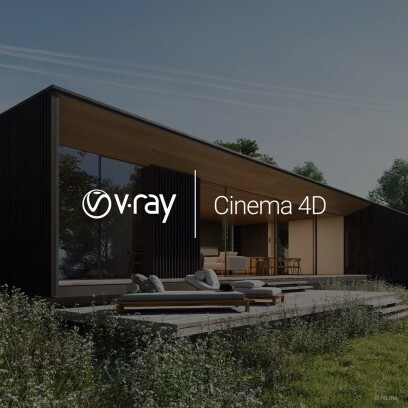 Automatic Sampling: V-Ray’s automated sampling with variance-based adaptive ray-tracing offers dramatically improved workflow and eliminates the need for fine-tuning complex settings. Just choose the GI engine type, render time — and render! And enjoy the instant feedback via V-Ray’s progressive rendering. Physically Based Materials: V-Ray for Cinema 4D offers real-world and multi-layered BRDFs for the creation of physically accurate materials. V-Ray’s special BRFD materials give you access to all the tools you could need. MAXON Hair, Fur and Grass Support: V-Ray for Cinema 4D supports Maxon Hair via V-Ray’s memory-efficient hair procedurals, as well as V-RayFur. The V-Ray Hair BRDF also provides physically accurate hair shading for great-looking results.